Anna’s big-time players made the big-time plays needed for a big-time win Friday night over Fort Recovery. Fourth-and-nine at the Anna 36-yard-line. 1:41 left in the game, no timeouts, last chance for Fort Recovery to win the game down by five. Sophomore quarterback Clay Schmitz took the snap and rolled right, looked downfield, and appeared to have sophomore receiver Gavin Thobe open in the end zone. Enter Isaac Lininger. 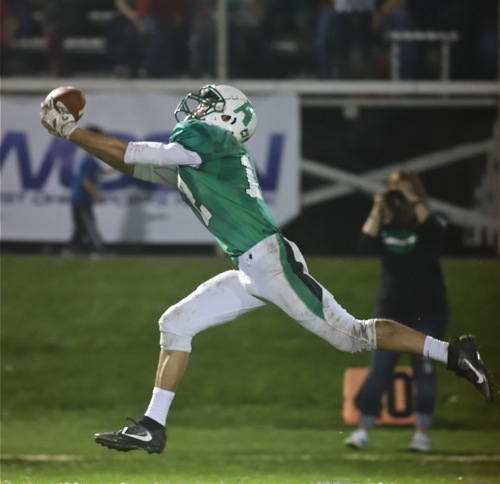 The junior corner batted the ball away and secured a 39-34 win for the Anna Rockets over the Fort Recovery Indians Friday night in Anna, Ohio. In hard-fought games like this, it’s the heroes of your team, the leaders that must step up and do the things necessary to win. For the Rockets, each of their team’s leaders entered at key times Friday. Everything looked bleak for Anna early on. 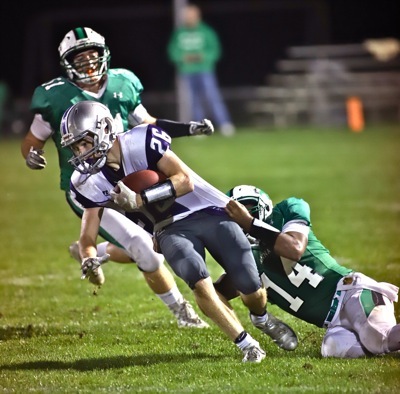 Fort Recovery prides itself on quality special teams play, with a kick return unit featuring a pair of returners who finished on the podium in the OHSAA 4X100 meter relay championships for track. Anna opened the game with a kickoff right at one of these speedsters, junior Riley Pearson. The ball bounced over his head, forcing him to back track after it hit the ground twice and came dangerously close to being recovered by the Rockets. Instead the coverage broke assignment going for the ball, Pearson picked it up and outran everybody for an 85-yard kick return touchdown to put Fort Recovery ahead 7-0 12 seconds in. Anna’s first offensive drive was a three and out, and a 29-yard punt gave Fort Recovery sophomore quarterback Clay Schmitz to show off his Herculean arm. And show off he did. 54 of the Indians’ 64 yards on the scoring drive came through the air, culminating in a 27-yard touchdown strike to Gavin Thobe that Schmitz couldn’t have placed better if he was standing next to the sophomore. Fort Recovery was up 14-0 less than four minutes into the contest. Enter junior running back Riley Huelskamp, Anna’s first hero. 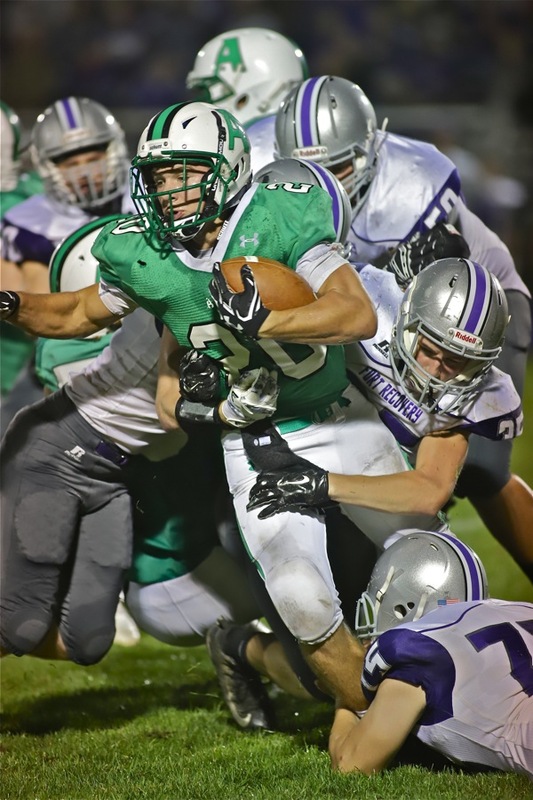 Anna’s Kam Steward drags down Fort Recovery running back Derek Jutte. Anna fed its star shake n’ baker seven times for 72 yards the next drive, including a 46-yard burst and a two-yard scoring plunge to chop the lead down to 14-6. He ran for 191 yards and four touchdowns when all was said and done. “We always rely on [Huelskamp], everybody knows that,” Marino said. Fort Recovery’s response was quick, a 40-yard touchdown run by sophomore running back Derek Jutte. Anna went three-and-out again right after. Down 21-6 in the second quarter and without possession of the ball, it looked like Fort Recovery may run the Rockets out of their own stadium Friday night. Enter junior linebacker Kam Steward, Anna’s second hero. On third-and-six, Fort Recovery sophomore quarterback Clay Schmitz dropped back to pass, and under duress, fired an ill-advised pass Steward intercepted and returned all the way to the eight-yard-line. The Rockets scored a touchdown four plays later on a one-yard run by Huelskamp. Streward came right back out and brought down Jutte for a five-yard loss, putting the Indians behind the chains and getting Fort Recovery’s offense off the field in three plays. Steward finished the night with 10 tackles, 1.5 for loss and the interception. The Rockets still trailed 21-13 with the ball back at their own 28-yard-line. Enter junior receiver Jeffrey Richards, Anna’s third hero. Jeff Richards lays out to haul in this 41 yard bomb to set up Riley Huelskamp’s third touchdown. Richards, long considered the best wideout on Anna’s team, laid out for a 41-yard catch early in the drive to set Huelskamp up for his third touchdown run two plays later. Fort Recovery’s lead was down to 21-20 at the 3:49 mark of the second quarter. Huelskamp still wasn’t done in the first half though… he broke off a 20-yarder on the ensuing drive and scored from eight yards out with 47 seconds left until the intermission to put Anna ahead 26-21, his fourth of the opening 24 minutes. It capped a 15-point comeback for the Rockets. “These kids got a lot of fight in ‘em and they don’t ever quit,” Marino said. Anna came out with the ball to start the third quarter. A fourth hero emerged as a ball floated into the endzone from fifteen yards out, easily catchable by the offensive or defensive player in the area. Junior Justin Murray came down with it to make the lead 33-21. After a goalline stand involving four straight incompletions, it looked like the Rockets had this one in the bag. Then Huelskamp went down with an injury, never to return. That had repercussions not only for the offense but the defense, where Huelskamp finished with five tackles and a pass break up in the defensive backfield. Fort Recovery was going to have to throw the ball to get back in the game, making secondary play a pertinent issue for the Rockets. The Indians took advantage and went on a 70+ yard scoring drive to cut the lead back to a possession at 33-28. Enter junior quarterback Bart Bixler, Anna’s fifth hero. On third down at the Fort Recovery 39-yard-line, Bixler kept the ball on an inverted veer play and shifted through crowds of Indians defenders en route to his first touchdown run straight up the middle of the field. He finished with 108 rushing yards on 15 carries (sack yardage not included) and 63 yards passing. Anna had trouble running out the clock without Huelskamp, and gave up a 64-yard touchdown pass to Pearson. The lead was 39-34 after a failed conversion attempt, and Anna’s next drive ended in a punt with 2:34 to play. Schmitz led his team all the way inside the Rockets’ 40-yard-line. But it all worked out for Anna, thanks to Lininger’s bat down that made him the sixth and final hero.